Today Mackenzie and I had lunch with Chris at the park. It was a little chilly, actually — so odd for the end of May. We played on the swings and on the slides. It was so much fun. I took pictures and video, but I lost them when I synced up my replacement iPhone. First time that has happened. I’m so disappointed that I can’t share them with you. When we pulled into the driveway at home this afternoon, I noticed the Bradford pear tree in the front yard is no longer covered in cicadas. Perhaps this means the Mid-State cicada invasion is almost over. Lord, please let it mean it’s almost over. I dream of the day we will be able to play in our backyard, swing on the rope swing, and tend the garden mulberry and cicada free. I dream of creating a little spot with a chair shaded by an umbrella, sitting right next to the tiniest of baby swimming pools. I dream of putting Mackenzie in her new swimsuit and splish-splashing around in the sunshine. so sweet. 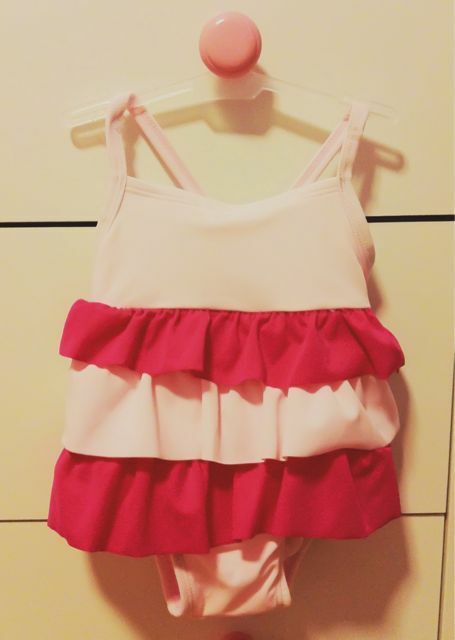 i love the ruffles 🙂 our plans for this summer are probably to stay in the pool as much as possible since it will be HOT. OMG, that is the most adorable swimsuit that I have ever seen! Our plans are to spend as much time outside each night as possible! Sounds fun! Where do you live again, Amy? Evenings here in Nashville are the best (and most bearable) part of summer. We’re hoping to set up our patio this summer so we can enjoy the backyard a bit more.